This massive research article was written by Ian Graham. He wrote The Complete Guide of Long Jump Statistics and the Michael Johnson Deep Dive, which is an in-depth look at Michael Johnson’s performances and splits. We also co-wrote Will Richard Kilty Break 10 Seconds? This article started off as a conversation asking a few key questions to the 4x100m relay. What is the best time for the 4×100 without any sub-10 100m individual performances? With Jamaica and USA finishing 1-2 without getting DQ’ed, what do you need to run to grab a bronze medal? (Adding 1+2 above) Can you win a Bronze medal without 4 sub-10 guys? How do you calculate your relay potential based on the 4 individual season best performances? Is the push-pass really the best method for baton exchanges? 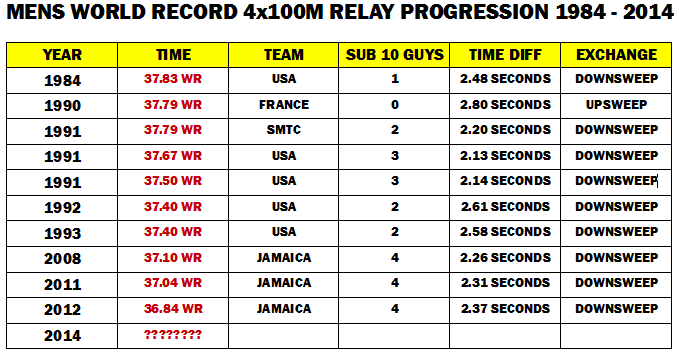 Out of the last 10 4x100m mens relay World Record teams, covering 1984 WR to 2012 WR times, there has only ever been one team that had ZERO sub 10.00 second athletes on their team. That team was the 1990 French team, who ran that time at the European championships in Split. Their time of 37.79 seconds is very impressive, considering they had zero sub 10.00 second athletes in the team, and they had a 2.80 time differential. 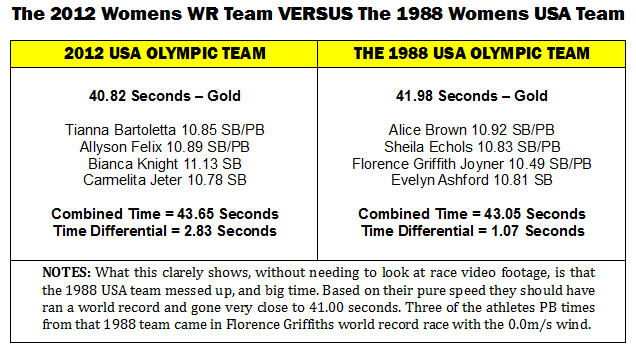 It’s interesting to note that all 10 teams clocked 37.83 seconds or faster, and the world recod has improved 0.99 of a second from 1984 to 2012. It’s now 2014, so 30 years for a 0.99 of a second improvement. That may not see impressive to the average person, but to us in the track and field world we know that’s huge. The 100m record in 1984 was 9.93 seconds (Calvin Smith, 1983), so the 100m event has improved 0.35 of a second between 1983 and 2009. So 30 years on and the 100m has imroved 0.35 of a second. Now that’s one hell of an improvement for 100m within a 30 year or less time frame. If you take a look at the table below, you’ll see the various WR teams from 1984 to 2012, and the year of each teams WR performance. I have also included information on what style of baton exchange was used by each of the teams. However, I can’t ensure accuracy on this for all teams, as it’s quite difficult to source this kind of information or analyse from race videos. Sub 10 guys… this number indicates how many athletes within that team broke 10.00 seconds that year. The French team as I stated had no sub 10 guys on their team. Their SB and PB times were all outside of 10.00 seconds. Notice that there’s a general trend… the 1984, 1990 and first 1991 WR teams had 0-2 athletes who broke 10.00 seconds the year of those world records. All other world records in the 1990’s had 2-3 athletes on their teams that broke 10.00 seconds the year of those world record performances. 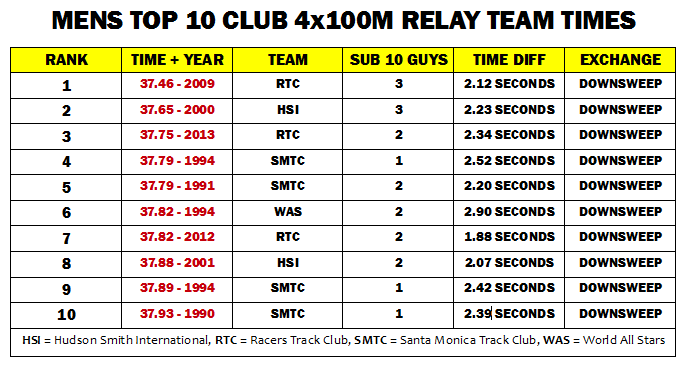 From 1993 to 2008 there was no relay world records produced. As far as I’m aware that’s the biggest gap in between world records since the 1956 USA team broke the USA’s 1936 world record time. There has been a lot of USA teams that “should” have broke the 37.40 world record between 1994 and 2007. 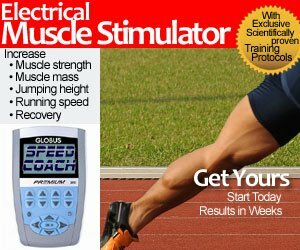 There are cases throughout this article where I was unable to find a genuine seasons best time for a number of athletes. In those cases, I either used their PB time or worked out a time to use based on the world lists for that year or their national ranking lists the year prior or post the relay performance. There’s not many of those cases, but I just want to make that clear. The general trend… we notice is that the faster teams have a lower time differential number. If you look at the last 3 world records from the Jamaicans you’ll see the time differential in the 2.26 to 2.37 second range. The French teams 2.80 second time differential to me, indicates a very well drilled team, who make very litte errors, if any at all. If you look at the other charts further down the page, you’ll see a lot of the european and other non USA or Jamaican teams have a time differential of 2.50 to 3.00 seconds. The 1995 Australian team stands out to me, with a time differential of more than 3.30 seconds. We could read into a lot of things, but don’t take this information as some form of scientific evidence for relay performance. This information, and the calculations, can be used to project a teams performance “potential”… but does not guarantee a teams performance. A lot can, and often does, go wrong with relay teams. Notice the number of sub 10 guys per team, and how it drops from 4 to 3, to 1 and then 0. The Cubans are an interesting team to look at. 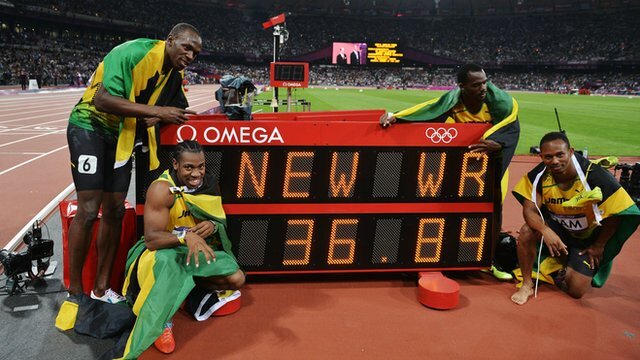 They’ve ran times of 38.00 (1992), 38.04 (2000), and 38.06 (1997), and the teams were of different athlete make ups. They had time differentials up in the 2.75 range or more. To me that’s very impressive. 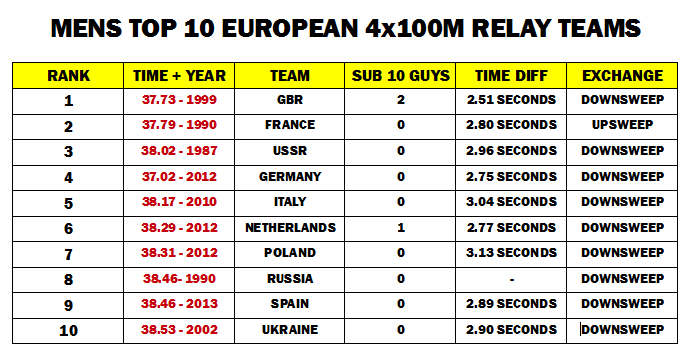 Their 1992 team that won bronze in Barcelona had zero sub 10.00 second performers, and they had no one contesting the individual 100m/200 events. From what I could find of the 1992 Cuban team they had PB times of 10.06, 10.17, 10.27 and 10.33. Here’s a video tape of the 1992 Barcelona men’s 4x100m relay final… which features the Cuban team that ran 38.00 seconds, and the USA “DREAM TEAM” that clocked a 37.40 world record. Here’s a video of the 1990 European Championships 4x100m final from Split. The race the French won with a 37.79 world record clocking at the time. That French team had three men from their 4x100m team make the 1990 European championships 100m final, one of which medalled (silver). The other team member was in the 200m final and medalled (silver) in that event. The British team that finished second in that race also had three finalists in the 100m, which included the gold medallist in Linford Christie, and the bronze medallist in John Regis. Regis and Christie reversed medal positions in the 200m event, with Regis taken gold and Christie the bronze. 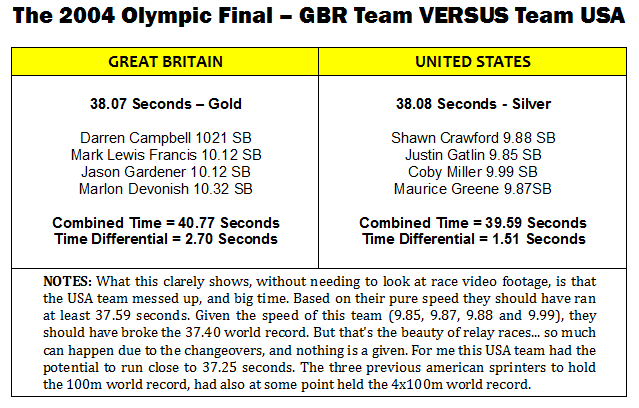 The British team ran 37.98 seconds in that race and had a 2.77 second time differential based on Linford Christie’s SB time of 10.02, John Regis’s SB time of 10.20, Marcus Adam’s 10.23 PB time and Darren Braithwaites 10.30 SB time. One of the main reasons why the time differentials are so low for many of these CLUB teams can be down to the fact that most club teams run these races in the early part of the season… usually April, May or June time, when they’re not in “peak” shape… and if I’m using the athletes SB times that come later on in the season this will greatly effect that time differential number. The 2012 USA womens team that ran 40.82 seconds broke the 1985 world record of 41.37 seconds, which was run by the GDR team. The USA womens team knocked 0.55 of a second off the previous world record, and 0.65 of a second off their own national record. Jimson’s 4x100m Relay formula to project team performance “potential”. What Jimson likes to do 100% matches up with what we’ve discusssed in this article. He will add the four athletes SB times to find the accumulated or combined time, and then subtract 2.70 seconds. He initially subtracts 1 second for each changeover, since the athletes are flying at the time of the baton exchange. He then adds on a tenth of a second (0.10) for each changeover. Takeways… use this information to project team performance potential. Look at your own teams performances across a number of seasons and see if you can notice any trends. If coaching elite teams, I’d want to see how my team compares to others based on the raw speed the team has, and the combined time and time differential. WATCH OUT… for the British and French teams in 2014, as I feel both teams could have the speed potential to break 37.50 seconds, which I feel should be the next target for European teams such as Britain and France. Last year the top 4 Britains over 100m had a combined time of 40.10 seconds, while the top 4 French athletes had a combined time of 40.29 seconds. I hope we get to see the best every European 4x100m match up in Zurich later this year at the European championships.